I found a great little project for my week off in a book I found at a flea market called “2X4 Projects for Outdoor Living”. It’s a play on words since most projects but not all use 2X4 lumber but there are 24 projects in the book. 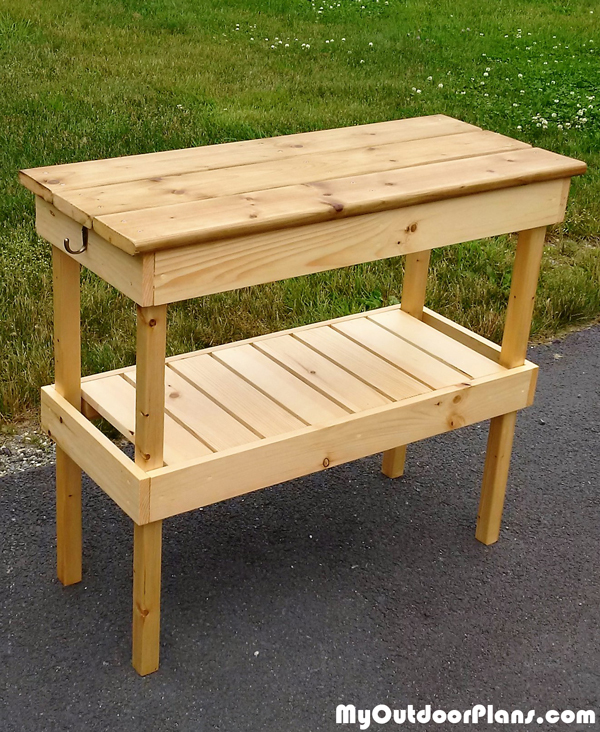 There is a simple BBQ Table building plan in the book that can easily be done in a day at a cost of about $50 (since building materials cost an arm and a leg around here). Materials wise you need 1X4X6 (6), 2X2X6 (2) and 5/4X6X8 (2) for the top. You also need a bunch of 1 1/2″ screws and some 1 1/4″ pocket screws to join it all together. You can see from the picture, you start with making two “boxes” for the bottom and top shelf, I used pocket screws to make these. You then screw the top shelf to the top of the legs using 1 1/2″ screws (pre-drill holes of course) and screw the bottom shelf to the legs about 12″ down from the bottom of the top shelf. The only thing you can’t see in the picture is that I attached supports for the bottom shelf slats to the sides of the bottom shelf, attach these supports 3/4″ down from the top ridge of the bottom shelf since the shelf slats are 3/4″ thick. I used 3d finishing nails to attach the bottom slats to the supports. There is also a center support for the top shelf that bisects the sides of the top shelf using 1X4. The last step is to attach the top boards using 6 1 1/2″ screws for each board and attach some hooks to either end. Thanks and I hope you enjoy making this project!